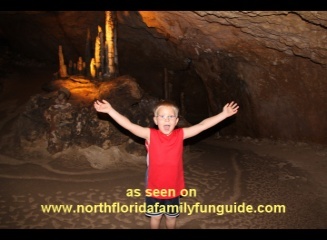 Come explore the only open air cave tours available to the public in Florida right here. Tucked away inside acres of forest, trails, swimming and camping areas of this Florida State Park is a Cavern system that has been in place for thousands of years. Tours depart daily from their visitor center within the park. Also at this location is a very thorough interpretive museum which explains the cavern system, what it is, and how it has been used in the past, and how it was discovered. Topics also include the animals that live and grow here, with colorful displays and hands on exhibits. There is an informative movie in the theater room, which gives a clear overview of Florida Caverns State Park, it's features and amenities, and an overview of the caves themselves. The tour lasts about 45 minutes, and is lead by an informative Tour Guide eager to answer questions and help you navigate through the twists and turns, low impasses, and narrow passageways within the caves. Going into the caves, I felt transported into another world! The cavern's interior, filled with limestone stalactites(on top), stalagmites(on the bottom), soda straws( small straw like limestone formations), flowstones, and draperies (flat, wide limestone formations), made me feel like I was visiting Mars! Everything was lit up as we traveled from room to room, and we even saw a bat flying right in front of us, searching for some lunch! The cool cave air was a comfortable relief from the outdoor heat of the summer. This was a very interesting experience! The park has a well shaded, and roomy campground, with very nice bathroom facilities and hot showers. They have a washer and dryer available right there which I thought was such a nice amenity. Dry firewood is available at the office. Equestrian camping is available on the far side of the park just down the road. The swimming area at Blue Hole, is actually a sink filled with turquoise water. Recently renovated with a new boardwalk and dock area, it was very nice looking. However, it was a little unsafe for us, because you cannot see through the water, so I would not let Bryan swim there. Found out later that an alligator was discovered there earlier in the morning!!! We will stick to the springs!